This is one of those books that you pick up and time stands still, because you’re so engrossed in what’s going on that nothing else seems to matter. I picked this up at the library on a Friday afternoon and sat right down on the couch there and dove right in, not realizing that an hour had passed and librarian dude was standing next to me, about to tap me on the shoulder to warn me they were about to close. 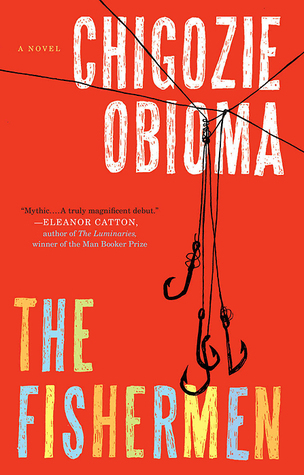 “The Fishermen” is the story of four brothers–Ikenna, 15, Boja, 14, Obembe, 11, and Benjamin–who is 9 years old when the story begins. The novel is told from the point of view of the youngest child, Benjamin, who looks up to his brothers and decides to join them when they begin skipping school to fish at the local river. At the river they encounter an outcast, a local madman who makes a terrifying prophecy: that Ikenna will be murdered by one of his brothers. From this point onward, nothing is ever the same. Each of the brother’s fates change for the worst and the entire family as a stable unit gradually becomes undone. But this is more than just a retelling of the Biblical story of Cain and Abel, this book has all of the complexities of a Shakespearean tragedy. There is a lot of violent imagery in this novel, coupled with beautiful words that I found myself going back and reading over and over again. There are also thoughtful references to the work of Chinua Achebe, and one can’t help but to read this book as an allegory of the African continent–ravaged from the outside and left to corrode through corruption, greed, and other inside forces.